One of my favorite questions to ask chefs and fellow diners is what kind of restaurant they think St. Louis is missing, then ignoring them if their opinion isn’t the same as mine. For me, predictably, the answer is modern, chef-driven Asian cuisine. If I could launch the Whiskey and Soba Restaurant Group, it would be made up of a Korean restaurant (Namu Gaji in S.F. ), a Japanese izakaya (a little bit Two Ten Jack Nashville, a little bit Raku Las Vegas), a carbon copy of the Taiwan-meets-Cambodia Maketto in D.C., and a higher end Chinese restaurant, like Paradise Dynasty in Singapore. Oh, I’d also kidnap Malcolm Lee and make him open Candlenut. 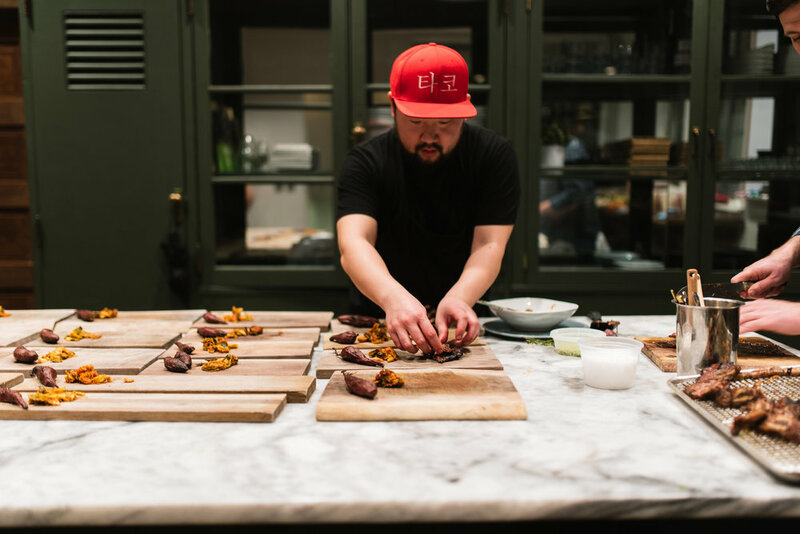 It’s probably not fair to take all of—or any of, really—the credit for Seoul Taco’s mastermind, David Choi, teaming up with STLBarkeep‘s Matthew Longueville to do a modern Korean dinner at The BHive, but I am a narcissist, so I will. Choi, along with Jonathan Lorentzen (Vicia), Jimmy Trinh (Tani), and Alex Henry (Nixta), put together a casual yet refined five course menu, plus starters, that left me begging him to open to bring back SeoulQ from the dead with some composed dish options, as well. Highlights included the amuse bouche with uni, fatty tuna, and caviar over a toasted rice cake; the savory octopus and scallion pancake, served with ikura and a gochujang-sesame sauce; the Korean smoked pork belly that literally melted in your mouth; and Choi’s version of a Korean steakhouse—galbi, marinated and grilled short ribs, served with Brussels sprouts kimchi and a buttery sweet potato. Basically, the point of this post is that you should tweet at Dave Choi and tell him to cook more dinners like this. Or, better yet, convince him to open another restaurant.